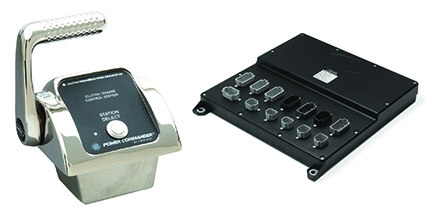 The EC300 Power Commander® Clutch/Engine Control system was developed specifically for applications requiring remote control of a hydraulic power take off (HPTO) or marine transmission and engine. The control system can have multiple remote control locations; each with a control head that provides the operator with neutral, clutch engage and throttle command, all on one lever. The EC300 Clutch/Engine Control system is based on our EC300 Propulsion Control system which has been used in the commercial marine industry for nearly 15 years. The EC300 provides for a number of configurable operational features; however all systems provide for active system monitoring, diagnostics and fault indication with event logging. An optional display is available for providing both operational data and system diagnostics.